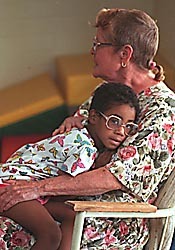 Five-year-old FAS victim Gabi Hoeft shares a quiet moment wither her adoptive mother, Mary Hoeft. She calls them blank days. Some days, Mary Hoeft's daughter remembers simple tasks, like how to pick up her toys and stack them in her toy box. "Then there are those days where the information just disappears. It's like a blank-slate day," says Hoeft, of her 5-year-old adopted daughter, Gabriella. Gabi was born at University Medical Center to two longtime street people. It was clear the infant had full-blown fetal alcohol syndrome. Immediately, Child Protective Services removed her from her parents and placed her in a foster home. At 10 months, Gabi went to live with Hoeft. The 56-year-old retired pediatric nurse has been a foster mother for nearly 20 years, specializing in children with failure to thrive syndrome. She has cared for about 20 FAS babies. Gabi had been in foster care with a family who wasn't familiar with the needs of FAS babies, and she came to Hoeft malnourished. "She was 10 months old, and she weighed 10 pounds," said Hoeft. In foster care, Gabi hadn't bonded with anyone, Hoeft said. "She hadn't been held or nurtured. She stayed away from me for a while." State officials tried to find a family with the same ethnicity as Gabi, who is half African-American and half Native American. "Nobody wanted her," Hoeft said of the fragile, badly damaged baby. Hoeft, the divorced mother of three grown children, heard of this child nobody loved and thought she could help. "I made a commitment to adopt her before I brought her into my home." 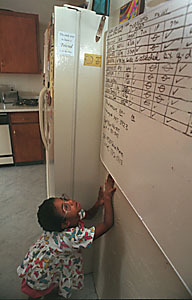 Gabby Hoeft gazes up at a chart for her brother Donovan, which lists his medication schedule. Mary adopted Gabby in part because she thought Gabby and Donovan have similar medical problems, although Donovan does not have FAS. The moment Hoeft saw the adorable child, she fell in love and knew Gabi was meant to be her daughter. "I wanted to give her a sense of belonging, a sense of family," Hoeft said. "I didn't want her bouncing around the system." When state officials could not find an African-American or Native American family willing to adopt an FAS child, Hoeft immediately began adoption proceedings. Gabi's birth parents opposed the adoption and fought it in court. But on April 29, 1996, Gabi legally became Hoeft's daughter. Hoeft worries about Gabi's survival in a confusing, sometimes heartless world. It saddens her to admit it, but it probably would have been better had Gabi not been born. "Neurologically, she's very, very damaged," Hoeft said. "On the blank days, nothing clicks. Things she was able to do the day before, she suddenly can't do. If those blank days stay, she won't be able to make it on her own."